The Jollie Biker will meet you on arrival in Twizel and transfer you to your accommodation. After introductions are made, we’ll have a bit of a chat about the exciting days ahead to ensure your trip will be as comfortable and memorable as possible. We’ll then fit you out with your bike and gear. Maybe enjoy a tasty dinner out in one of the great restaurants in Twizel – we’re happy to give you recommendations and can arrange bookings if you like. *If you are flying into Christchurch or Queenstown, you will need to arrive 1 day prior as Bus transfers depart from both cities early in the morning. 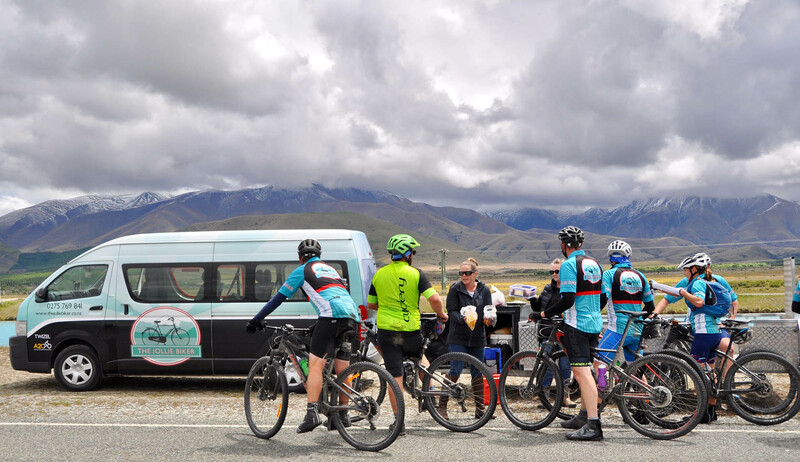 Enjoy a hearty breakfast at a local Café then The Jollie Biker will transfer you to Aoraki Mt Cook, arriving at the official start of the A2O, the Whitehorse Camping Ground – from here, a warm up ride 7kms to the airport. This morning after a sumptuous breakfast your ride takes you from Braemar Station to Tekapo B Power Station, continuing along the shores of Lake Pukaki a wonderful ride with Aoraki Mt Cook as your background, it doesn’t get much better than this! Perhaps a stop at the Visitor Info Centre and Mt Cook Alpine Salmon shop for an ice-cream or fresh salmon treat. A further 10km bike across the Pukaki flats brings you back into Twizel. Enjoy a second night returning to your original Twizel accommodation. 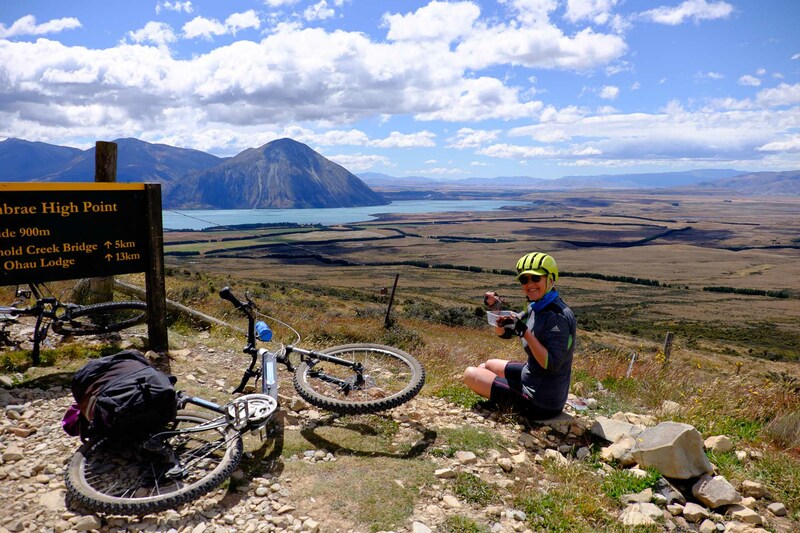 Breakfast booked at a local Cafe and a scrumptious packed lunch prepared for you, then on your bike….to Lake Ohau. Head out of town to the Ohau Canal, an easy ride along the canal to an off-road trail descending down to the lake foreshore, taking you to the Ohau Weir and onto the lake foreshore where it eventually meets up with the sealed Lake Ohau and onto Lake Ohau, your accommodation for tonight. After breakfast, you will enjoy a more relaxing day today, leaving Kurow you will follow the Waitaki River with stops at Kurow Winery (a great coffee stop). Crossing the Otiake River and the Otekaieke River the trail follows the highway to the Takiroa Maori rock art site, which is across the road from the trail. After visiting the rock art site, retrace your steps and continue on the trail that heads back down to the Waitaki River through the Duntroon Wetlands before arriving in Duntroon, perhaps a visit to the Vanquished World Museum to learn of the nature history of the area. Accommodation is booked at a local B&B. Dinner, Breakfast and Lunch packs included. From Duntroon you head to the unique rock formations known as Elephant Rocks. Today is a mix of on and off road sections winding through valleys surrounded by limestone escarpments. To the old Rakis Railway Tunnel and onto Windsor and over lush North Otago farmland on the west side of Oamaru. Arriving at Weston, you have a fantastic downhill into the Oamaru Botanic Gardens, before coming out in the Heritage Precinct, and the A2O finish line at the Harbourside. The Jollie Biker will meet you at the finish line with your luggage, then after the celebratory photos, maybe a coffee at the Rusty cafe, or a beer at Scott’s brewery …and a dip in the Pacific if you dare…. you’ll be transported to your accommodation in Oamaru. Own arrangements made for dinner tonight. The Jollie Biker can book your transfers to Christchurch or Queenstown or arrange a shuttle back to Twizel. We can also arrange vehicle parking at our depot. We do all the work, so you have all the fun! get on your bike and ride! We can also tailor make trips for groups of 4 or more.